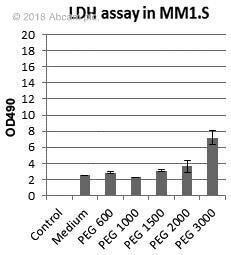 Lactate Dehydrogenase (LDH) Assay Kit (Colorimetric) ab102526 quantifies LDH activity in a variety of samples such as serum or plasma, cells, and culture medium. 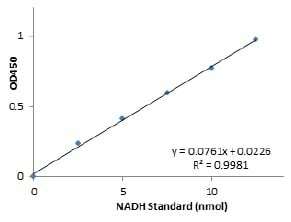 In the LDH assay protocol, LDH reduces NAD to NADH, which then interacts with a specific probe to produce a color (OD max = 450 nm). The kit can detect 1 - 100 mU/mL of LDH directly in samples. The assay is quick, convenient, and sensitive. As LDH is a fairly stable enzyme, the LDH assay is widely used as a marker for damage to cells and tissues, ie. to measure damage that is severe enough to allow LDH to leak from the cell. Fermentation; pyruvate fermentation to lactate; (S)-lactate from pyruvate: step 1/1. Belongs to the LDH/MDH superfamily. LDH family. Functional Studies - Lactate Dehydrogenase Colorimetric Assay Kit (ab102526)Image from Xu Y et al., PLoS One. 2014;9(6):e100127. Fig 2(B). ; doi: 10.1371/journal.pone.0100127. Cellular necrosis was measured as LDH release after cisplatin treatment for 24 h and 48 h using ab102526. 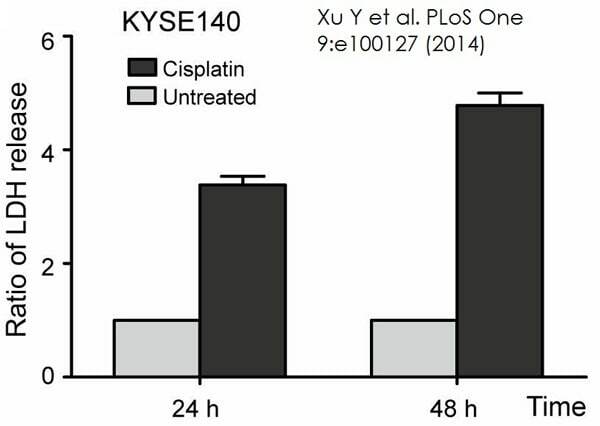 The release of LDH was apparently increased at 24 and 48 h after cisplatin treatment. 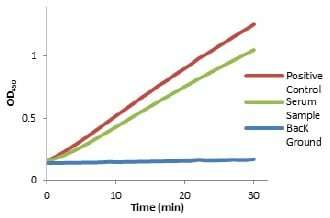 Kinetic profiles of approx 0.5 mU of a sample of pure LDH (Positive Control) and 2 μL frozen human serum using buffer as a background control. Publishing research using ab102526? Please let us know so that we can cite the reference in this datasheet. Set up 48-well plate using MM1.S cells. At final timepoint, collect all cells, spin celle to pellet and add 100 ul of LDH lysis buffer. Add 50 ul of stop solution. I sthe kit ab65393 suitable for tissue culture supernatant. The kit ab102526 is more suitable for measuring the LDH activity in tissue culture supernatants - It can also be used for tissue extracts. ab65393 is only tested with cells and cell extracts - tissue extracts are yet to be tested therefore I we cannot confirm its specificity. More likely it will work with tissue extracts as well. Please note you might need to optimize the amount of tissue by trying several dilutions. I have kit for LDH # 102526 and I am trying to use it to measure the LDH on lung tissue. I used 50mg of tissue and homogenized in 250 μl buffer, then I spun down and used the supernatant. For my assay I diluted 1:10 the original supernatant and then I used 5μl for the assay. Based on the info you sent you basically diluted 1:10 once witht he original supernatant and then 1:10 again by using 5 ul plus assay buffer to make 50 ul total, so your final dilution is 1:100. Please let me know if you have any further questions. My question is, if we use 5ul of sample diluted to 50ul then what values should we use for the sample dilution and volume? The grad student running the assay used 10 for the sample dilution and 0.005 (5ul) as the sample volume, but I feel like this might be accounting for the dilution twice. The dilution is the initial sample dilution. If you have 10 µl of a sample and are diluting it 100 times and then taking in 5 µl from that diluted sample into the well, your dilution factor would be 100. In this case dilution would be 1 since you are taking pure undiluted 5 µl of the sample into the wells, and the volume will be 0.005 ml. vorrei sapere se avete un kit per misurare la lattato deidrogenasi direttamente dal terreno delle cellule. Ho questo problema tecnico: le cellule sono fatte crescere su scaffold e non vorrei staccarle per ri-piastrarle in una multiwell, ma vorrei solamente prelevare il terreno e lì misurarci la lattato deidrogenasi rilasciata. What I understand from your question is, that you would like a kit which measure lactate dehydrogenase produced from cells found in soil? In addition you would like to not detach the cells from the scaffold on which you are growing them to then replate them in the multi-well plate ready for the assay? We have a kit ab102526 that measures Lactate Dehydrogenase activity by colorimetric means. This kit is suitable to use with cell culture supernatents. This means that you would have to grow your cells on separate dishes e.g on your scaffolds and then detach them to centrifuge at 10,000 x g for 15 min at 4°C. This way the supernatent can be collected and used for the assay. The two vials are actually lysophilized products. It does not say this on the datasheet, however the protocol booklet itself (which should have come with the kit and can also be downloaded from our website) gives you the instructions on its use. The substrate mix can be dissolved in 1ml ddH2O. The standard should be dissolved in 0.4 ml ddH2O to generate the 1.25 mM solution. Adjunto a este mail envío el certificado de conformidad del kit ab102526. Espero que os sea de utilidad, y en cualquier caso no dudéis en contactarnos para cualquier duda o sugerencia. El pasado 28 de Septiembre recibí la oferta que adjunto. Se procedió a realizar el pedido de dicho producto y recibimos correctamente el kit. Hoy hemos intentado probar dicho kit pero hemos tenido un problema. Los productos que venían en el kit estaban mal etiquetados y en estos momentos estamos dudando de si el reactivo que lleva cada producto es el correcto. Adjunto una fotografía tomada de dichos reactivos. El número de lote del kit es: XXXX. Nos gustaría que nos pudiesen dar una solución, ya sea mandando un comercial para poder comprobar que dichos reactivos están mal etiquetados, llamándome por teléfono o mandando otro kit. Si necesitan alguna información adicional por favor pónganse en contacto conmigo.Muchas gracias. Te pido disculpas por la espera. Siento mucho los inconvenientes causados por la confusión al etiquetar los componentes del kit. Estoy chequeando con mis compañeros responsables los lotes que tenemos actualmente en stock para confirmar que se han etiquetado como corresponde. Una vez me lo verifiquen os mandaré un nuevo kit totalmente libre de cargos. Muchas gracias por tu colaboración y paciencia con este asunto. Inquiry: your protocol for this assay contain wrong information. data analysis: equation is wrong! LDH activioty=Bxsample dilution/ (T2XT1)xV should be LDH activioty=Bxsample dilution/ (T2-T1)xV . T1 usually is 0! try getting a data from multiplying your data with 0! I am sorry that the equation provided in the protocol booklet of the Lactate Dehydrogenase (LDH) Assay Kit (Colorimetric), ab102526, does contain a typing error. the equation should read T2-T1 as you have pointed out. Thank you very much for bringing this to our attention. This will be corrected as soon as possible. I am sorry for any inconvenience caused. If I can be of any further assistance, please do not hesitate to let me know. Hello: We are interested in using the colorimetric kit below for assays of culture media. Can you let us know if this kit requires that we use any special media specifically media with phenol red? Thanks for your enquiry regarding ab102526. Optimization, application, and interpretation of lactate dehydrogenase measurements in microwell determination of cell number and toxicity. Wolterbeek HT, van der Meer AJ. The lactate dehydrogenase (LDH) assay was addressed for its sensitivity, disturbances by foaming, and cell number and size. Cells were from a U-251 MG grade IV human glioblastoma brain tumor cell line used in 100-microl well volumes. Cells were counted by microscopy and Coulter counting; assays were LDH or trypan blue. The results indicate increased 490 nm signals (level, variance) by using phenol red or by increasing fetal bovine serum from 5% to 10%. The data also indicate that defoaming results in reduced variances ranging from a factor of 2 at 1-3 units of absorption, up to a factor of 4-5 at <1 units of absorption. Coulter counting indicated a decrease in cell volume with increasing end-point cell density, attributed to general shrinking at increasing density. In comparisons, total LDH was considered relative to both cell total volume and cell numbers. The result suggests that total LDH should be regarded as reflecting cell total volume rather than cell numbers. In a comparative Cu exposure test, signals of both LDH and a sodium salt of 4-[3-(4-iodophenyl)-2-(4-nitrophenyl)-2H-5-tetrazolio]-1,3-benzene disulfonate (WST-1) decreased with increasing Cu supply, while bromodeoxyuridine signals remained largely unaffected. The data show the differences in responses in cell viability and proliferation, but, above all, indicate that LDH should be expressed on a per cell volume basis rather than per cell, to avoid the problem that mere density effects contribute to signals on compound or metal toxicity. We are not certain if it would be true for this kit as well and that is why we don’t recommend any specific media. Hope this information has been helpful for you.